In spring 2016, dozens of collared mule deer (orange lines) migrated into the high mountains of western Wyoming. 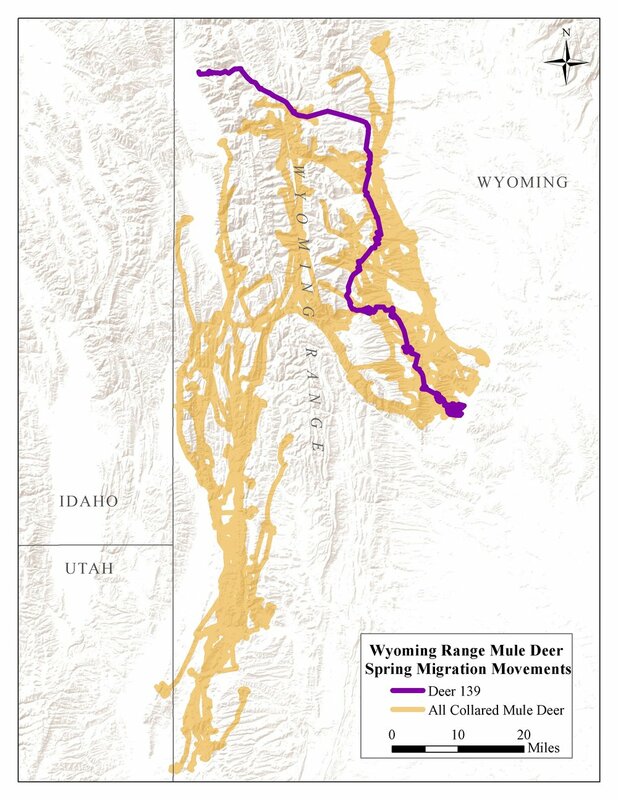 Deer 139 (purple line) traveled 85 miles through the Wyoming and Salt River Ranges. We are making a 20-minute documentary film that tells the story of deer 139’s migration and the researcher who mapped it. University of Wyoming research scientist and adventurer-at-heart Samantha (Sam) Dwinnell knows the Wyoming Range mule deer herd as well as anyone. She has spent the last five years on the ground capturing and collaring mule deer to track where individuals go, how they connect with the landscape, and how that relationship affects their survival and reproduction. Sam’s work shows wintering mule deer are utterly dependent on their ability to access distant, productive, high-elevation summer ranges via migration. Her findings have significant implications for conservation. This film moves these concepts and discoveries from the academic literature into the public consciousness. Sam—along with an all-women team of fellow adventurers and naturalists—walked deer 139’s migration trail for 85 miles from her winter range in the sagebrush steppe outside LaBarge, Wyoming, up into and over the Wyoming Range, across the Greys River, to an alpine cirque in the Salt River Range, to see first-hand this long, complex, and, until now, largely invisible journey. The team carried skis, pack rafts, food, and camera equipment, to film the expedition and bring viewers along for the adventure. Widespread conservation of wildlife and habitats is contingent on public support, which our film will generate. We aim to achieve three objectives with this film. Our goal is to use visual storytelling to engage audiences in a story of the deep connection between animals and their environment and to share an argument for sustaining intact landscapes.